I never used to care about family history. I suspect most people under 30 or so don't. You still think you're immortal, even if you know the odds are against it. I believed that. I dismissed genealogy. Who cares? Like my detective, DCI Grant Foster, my view was that all you need to know about your great-great-great grandfather was that he had funny facial hair and he wasn't firing blanks. It takes a death or a birth usually, something taken away or added, to make people think about the past and their roots. For me it was the birth of my son. I was 32 and it suddenly occurred to me that the Waddell name would continue because I'd had a boy. I got a real thrill from this. The line would continue. Then I thought: what line? I knew nothing about my past. Nothing about where this Waddell name, of which I was so proud, derived. So I started to look. I asked my father when he my grandparents were married so I could get hold of their wedding certificate and use that as a starting point. He said 1936, four years before he was born. I went to the Family Records Centre in Islington, London and began scouring the birth, marriage and death indexes, thrilling at seeing what in essence was a list of all those who have lived since 1837 - a catalogue of the dead. No one else in my family had done this research. I was treading virgin snow. I was beginning to understand why this hobby was becoming a national obsession. It turned out my grandparents didn't marry four years before my dad was born. They married four months before he was born. My grandmother liked a stiff gin and a cig or twenty, but she was a good Catholic woman. So we thought. It was the same story for her mother, an even stricter Catholic. She married while pregnant. No one thought less of these women. In fact, these bits of information brought them to life, made them seem real, three dimensional, rather than the sepia-toned depictions of them on photographs. I always knew my granny liked a bit of fun. This seemed to confirm it. As a reformed tabloid hack,I found this sort of secret was intriguing. I wrote the book that accompanied the first series of Who Do You Think You Are? on the BBC. My amateurish attempts to trace my family history stood me in good stead. It meant I could take people through the basic building blocks of family history with genuine enthusiasm rather than the jaded been-there-done-it-got-the-ornate-family-tree-on-the-wall tone of many other 'How to's'. The series was a huge success and the book rode the bandwagon to the top of the bestseller lists. However, my mind was already elsewhere. Since a kid, ever since I read Emil and the Detectives, I've loved crime fiction. 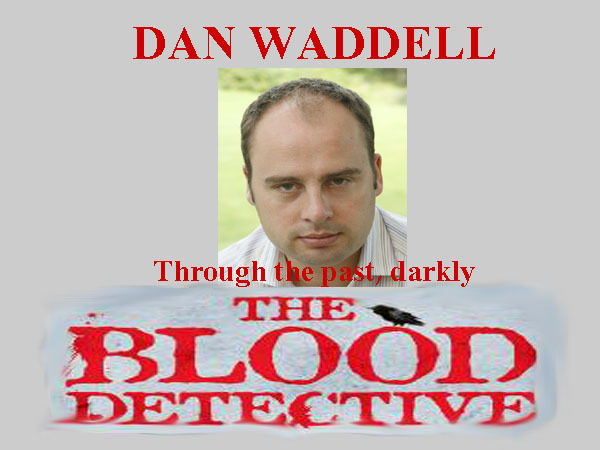 I'd tried to write two or three crime novels but the right idea and the right characters proved elusive. One night in the pub, after a hard day at the Family Records Centre researching the book, the idea came to me. What if a body was found in the present day with a reference carved on him that led the police to a death certificate of a man murdered in the same place, on the same day but 125 years before. What if the police needed the help of a young genealogist to help solve the murder? I was a wee bit drunk so I texted the premise to myself. The next morning, unusually for flashes of drunken inspiration, it still seemed like a good idea. You won't hear me bemoaning the ubiquity of mobile phones. The characters came easy: Nigel Barnes, a young family historian who's disenchanted with his job researching family trees for maiden aunts in Kent, who craves excitement, a man for whom the present is too jarring and painful and who loves to escape into the past. Contrasted with him is DCI Grant Foster, who lives in the present because the past is too awkward and haunting. The rest of the plot flowed. I tried to make the genealogy as compulsive as it is when you're the person poring over your ancestor's signature, or their cause of death, or their description on a census return, or their army record, or even their grave. The past falls away, the years vanish, and you are faced with another human being like you, one that lived and loved and aspired. Who, just like you will, ended up six feet under. Tracing your roots is a humbling experience, to say the least. I'm one of those who's more interested in the dark aside of our family trees. The skeletons, the rogues, the criminals, the black sheep. I didn't find any in my family tree, sadly. Just a few hard-working peasants. But finding out about them has made me realise how I got to be where i am today. I know more about the Waddell line and my place in it. I realise how the past can impinge on the present, even if it’s laid dormant for years, a theme of my book. As dawn breaks over London, the body of a young man is discovered in a windswept Notting Hill churchyard...And the killer has left DCI Grant Foster a cryptic clue. However it’s not until the clue is handed to Nigel Barnes, a specialist in compiling family trees, that the message becomes spine-chillingly clear. It leads Barnes back to 1879 – and the victim of an infamous Victorian serial killer.